South Ossetian officials are accusing Georgia of preventing refugees from returning home to the remote Ossetian town of Leningor. Before Georgia's offensive last August, the South Ossetian town was governed by Tbilisi for nearly two decades because most of the population is Georgian. Even now there is strong Georgian control. Many of its residents fled after Georgia's troops were driven out of the Republic. 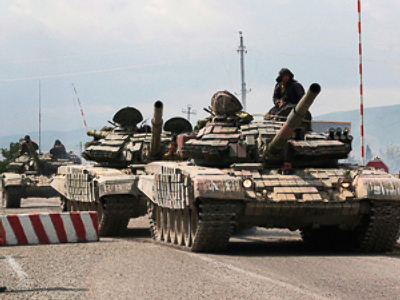 For example, the local winery was shut down last summer when Georgian tanks entered the South Ossetian capital of Tskhinval. The Georgian workers fled to Tbilisi, fearing possible revenge from Ossetians. Before last August, there were about 9,000 people living there. Now the number is somewhere between 3,000 and 5,000. Some citizens are coming back while others leaving. It is the only place in South Ossetia where Georgian currency is in use alongside the Russian ruble. Zaur Asaev, a local official, needs six specialists in his office, but his attempts to find workers have been in vain. “I offer them a job, tell them, ‘Start from the beginning of the month’, but they don’t for some reason. I ask them, ‘What’ the deal?’ They just make up excuses. But I know the reason – they are afraid of someone in Tbilisi,” says deputy mayor Zaur Asaev. Last August, Georgia launched an offensive against South Ossetia in an attempt to bring it under its rule. Russia sent in its own troops to repel the attack. The officials say Tbilisi is still doing its best to scare the locals. From time to time, some provocative allegations about South Ossetian authorities are spread through TV and radio. One of the most beautiful corners of South Ossetia, Leningor was a favorite tourist destination during the Soviet era. Landmarks, such as a fortress built some four centuries ago, can still be found. The Leningor Castle used to belong to the local nobility. Now it is a museum. Thousands of tourists used to come sightseeing here, but today there are virtually no visitors. The director says the last tourist was here approximately a year ago. With virtually no profits to speak of, the museum, which looks after artifacts from the Stone age right through to modern art, is merely trying to survive. “We had a very difficult time in August-September last year, but we did not lose any display items and survived somehow,” recalls museum director Vladimir Lunashvili. With no job prospects, life is likely to remain tough for the people of Leningor. US and EU attempted to "deprive South Ossetia the right to build its own life"